Great fun and good to see so many friends old and new. This entry was posted in News on June 10, 2013 by TP. This month we offered our first class at ACE – Alta Community Enrichment. Introduction to the Herbs and Spices of the Caribbean was a wonderful way for us to give back to an organization that has been so supportive of our venture and hosts some of the most fun and informative events in Little Cottonwood Canyon. Participants created their own versions of Sofrito and a Curry Powder blend, enjoyed a meal of a traditional fish stew, and vegetarian curry over sofrito flavored rice, and then took home a spice mix pack to further their artistic adventures in their home kitchen. Check out the photos, courtesy of ACE on their Facebook Page. This entry was posted in News on January 24, 2013 by TP. Pan searing – known as frying by my grandparents, is a great way to enjoy a Bajan (native of Barbados) favorite, Mustard. Mustard is in the pepper sauces (hot sauce) and flavors flour and egg dredges used on fish. 2 tablespoons of this blend mixed with 1/3 cup white vinegar refrigerated overnight will make a great mustard for a sandwich a good accompaniment to meats and veggies. Rinse the fillets and pat dry. Rub in the mustard blend and set aside for 10 minutes. Heat oil in a heavy skillet and slice the onion. When the oil is hot, sear the fillets on one side. When it’s time to flip (turning opaque on the edges) place the onion in the pan and turn fillets on top of the onion. When cooked to your desired doneness, pull the fillets and sauté the onions in the seasonings and butter. Serve cooked onions over the fillets. 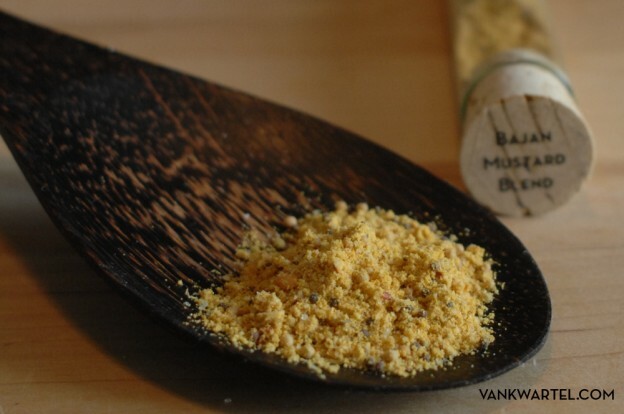 This entry was posted in Bajan Mustard Blend, Recipes on December 25, 2012 by TP. One of the great gifts from the Lebanese Diaspora in the Caribbean. I find some commercially available mixes to be heavy on the sodium, this mix allows you to add salt to your taste. 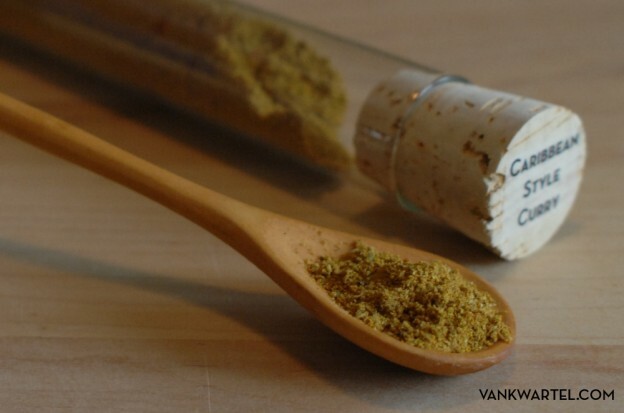 Explore sprinkling this on hummus or baba ganoush. Combine Za’atar with olive oil to form a nice slurry. Taste, add more salt if you prefer, dip in pita. Enjoy. Repeat. 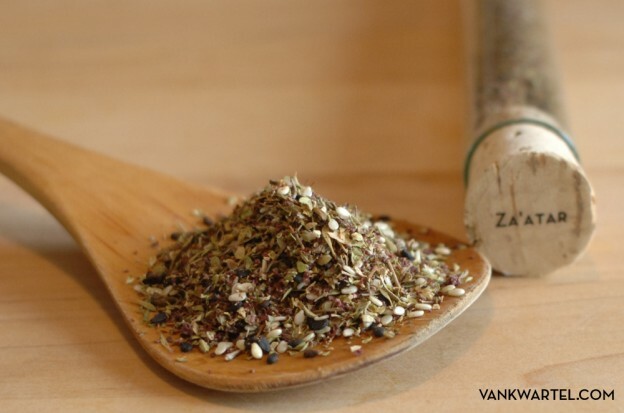 This entry was posted in Recipes, Za'atar on December 25, 2012 by TP. My first taste of curry was from family friends from Trinidad and Tobago. Milder in flavor than the commercially available “Curry Powder” add a scotch bonnet or habanero pepper, or two, for the traditional taste. Cut the chicken into bite sized pieces, chop the onions and mince the garlic. Marinate the chicken with all of the ingredients except the water and potato for at least 30 minutes. Dice the potato and in a heavy pot, sear the chicken pieces on all sides, approx 5 minutes. Add potatoes and water and simmer for 45 minutes or until juices thicken. This entry was posted in Caribbean Style Curry, Recipes on December 24, 2012 by TP. ‘5 spice’ could reference Chinese Five Spice Powder or this blend of seeds, which I now know is a Bengali favorite. Not sure how this got to us via Trinidad. However this mixture shines when sprinkled on dal, sautéed with onions or potatoes or as an accompaniment to curries. 2 tbsp butter, plain or clarified. Heat butter in a skillet on medium and when melted toss in the Panch Phoron and when the first seed “pops” stir in the onion. Reduce the heat to medium low and cook until the onions are slightly caramelized. 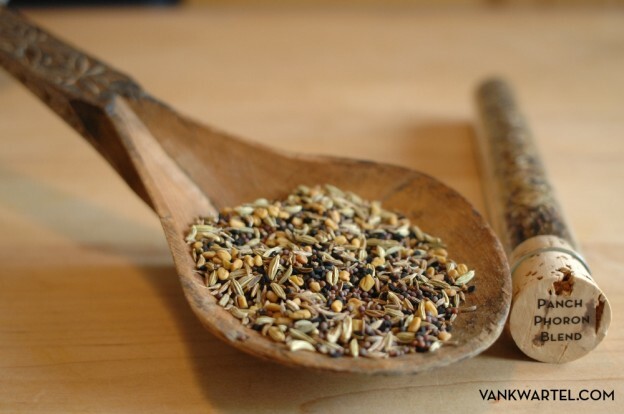 This entry was posted in Panch Phoron Blend, Recipes on December 24, 2012 by TP. Sweet, hot, sour and salty combine in this quick and easy sauce that is good for grilled seafood, fish and meats. To use the ingredients in a marinade, combine ingredients, but do not cook. A pinch of sweet chili in your hot chocolate will recall the Maya tradition of chili and chocolate. 1 tbsp olive oil or grape seed oil for higher temperature cooking. Combine all ingredients in a saucepan, bring to a light boil and reduce by about three quarters to one half. Drizzle over grilled goodness. 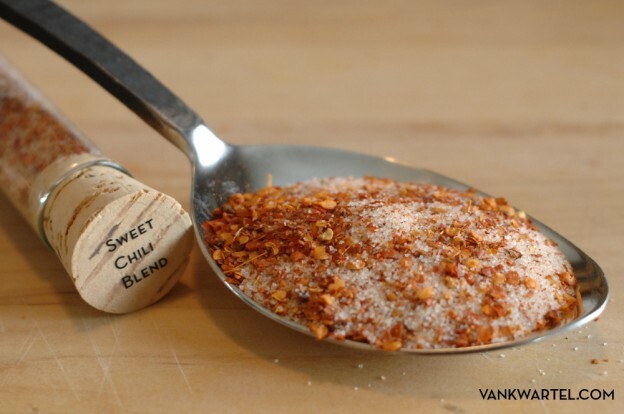 This entry was posted in Recipes, Sweet Chili Blend on December 23, 2012 by TP. A dessert as American as apple pie, but also infused with the sweet spices of the Caribbean. Adapted from the Tasting Table’s Rhubarb Galette. Or add a teaspoon to a 50/50 mix of box wine and rum for an island style gluhwine. Mix the butter, flour and salt in a food processor until the butter forms peas. Slowly drizzle in the ice water until the dough forms a ball. Cover in plastic wrap and rest for 1 /2 hour. Slice the apples thinly and toss in the Sweet Spice Blend and lemon juice. Divide the dough in half and roll out two circles. Arrange the apples in the center of each round of dough and fold over approx 1” edge on the top. Bake in a 375 degree oven for 1.5 hours. Let cool and enjoy with ice or whipped cream. 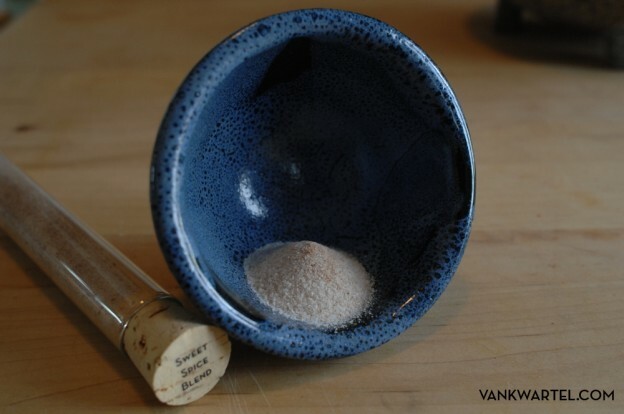 This entry was posted in Recipes, Sweet Spice Blend on December 22, 2012 by TP. Pronounced “Teekeen Sheek”. Traditionally, this is a roasted fish in banana leaves with a fire red spice coating. 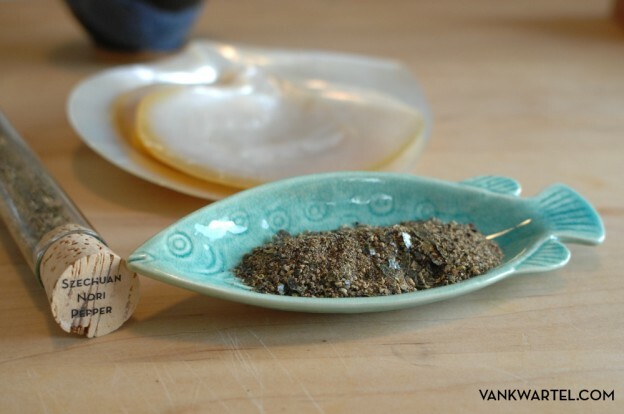 Use this pepper as a dry rub on your favorite fish or meat or sprinkle it as a substitute for traditional pepper. Simply rub on, sprinkle some salt to taste and grill over high heat. 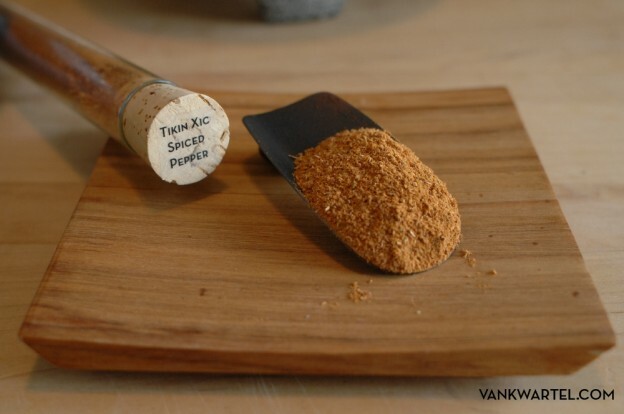 This entry was posted in Recipes, Tikin Xic Spiced Pepper on December 21, 2012 by TP. Szechuan and black peppers combine with nori for a dramatic presentation packed with umami and the mysterious numbing effect of Szechuan pepper. 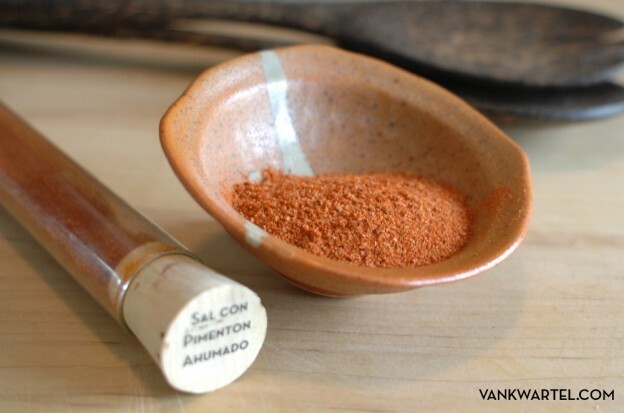 Use as a dry rub on fish or game or as a finishing pepper on soups. This entry was posted in Recipes, Szechuan Nori Pepper on December 20, 2012 by TP. Use these blends instead of the usual augmented salts. Sea Salt and Hibiscus flowers combine for the Sal Con Jamaica. Jamaica’s tangy flavor and vibrant violet color can encrust chevre on your cheese plate and add dramatic presentation to any dish. 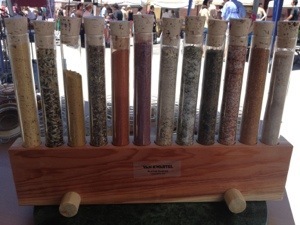 Herbed Salt Blend encrusted fish or shrimp is delectable. Equal parts Sal Piquant and olive oil create a marinade that transforms your go to salmon preparation. This entry was posted in Herbed Salt Blend, Recipes, Sal Con Jamaica, Sal Piquant on December 19, 2012 by TP. A grill favorite, or pan sear in butter for a quick treat. Combine the Sal Con Pimenton Ahumado, lime juice and olive oil. Marinate the shrimp for 10-15 minutes. Slip onto skewers and grill until just opaque. This entry was posted in Recipes, Sal Con Pimenton Ahumado on December 18, 2012 by TP. If you love this unique combination of heat and spice and can resist the temptation to eat the entire jar with chips, continue on. Marinate your protein of choice and 1/2 jar of marinade from 20 minutes for fish and seafood to 45 minutes for chicken, goat, etc. Grill or roast in the oven until the protein is done. You are looking for a dry crust of marinade on the outside but juicy inside. 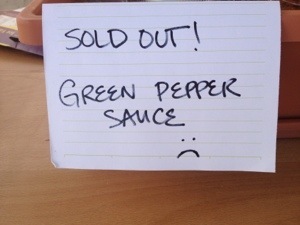 Use the remaining reserved marinade as a garnish. This entry was posted in Jerk Marinade, Recipes on December 17, 2012 by TP. Every Caribbean household seems to have it’s regional twist on hot sauce called ‘pepper sauce’ on the table with most every meal. Sprinkle a little on your breakfast eggs and soon you’ll be adding it to lunch and dinner as well. Use this smoky blend of peppers and mayonnaise to enliven your sandwiches and french fries. Better than those commercial brands full of preservatives, keep these refrigerated. 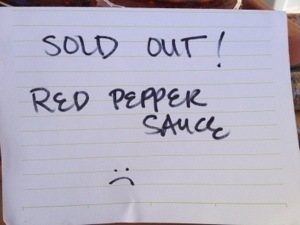 This entry was posted in Recipes, Red Pepper Sauce, Smoked Spicy Aioli on December 16, 2012 by TP. Pull out these sweet and hot preserves along with cheeses, chocolates, crackers and nuts for a change from the everyday snack. This entry was posted in Habanero Jelly, Jalapeno Serrano Jelly, Recipes on December 15, 2012 by TP.